The goal of this set of design experiments was to find ways to design low-level interactions. We wanted to find an approach for designing with appropriation by first choosing a technique for appropriation. The project started with a collection of images of appropriated objects (like jackets hanging on chairs, folded paper to hold a pizza, etc.). We categorized 'techniques' of appropriation as low-level interactions like hanging, folding, piercing, and stacking. We chose piercing as a technique to explore. All the following prototypes were made with the goal of exploring how piercing can inspire multiple interactions. 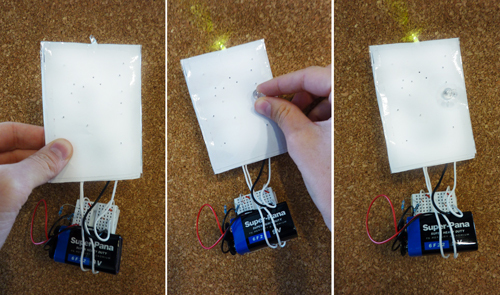 Meet the first prototype: the enhanced electronic post-it! 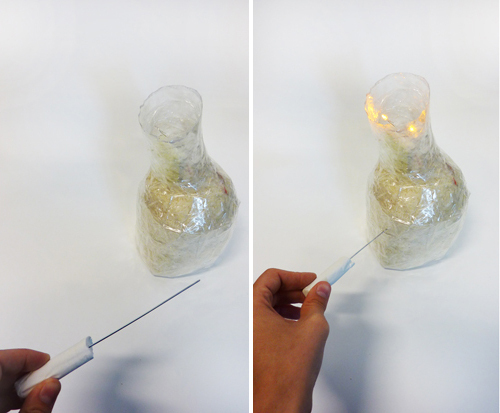 When you pin it, it'll light up! You can pin it with anything made out of metal, and to any surface of your choice! The poking Jar! 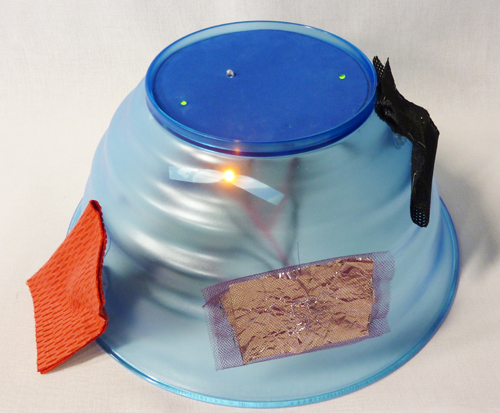 This jar shaped out of scotch tape, filled with rice and two layers of aluminum foil, lights up when a metallic pin reaches its center. A second version was also created, this one emits a strident sound when pierced. The cactus. The idea was to create a cactus in which people could pin messages or pieces of paper. The pieces of paper (or fabric) contained foil between two layers of the other material. The cactus presented a series of pairs of needles. Each pair has to be pierced at the same time so that the paper/fabric would conduct electricity and hence complete a circuit. LEDs lit up when a circuit was complete. This prototype required care in handling the object based on its ÔneedlesÕ. The stabbing cushion. This prototype explores a different scale with the action of piercing and the size of the artifact. 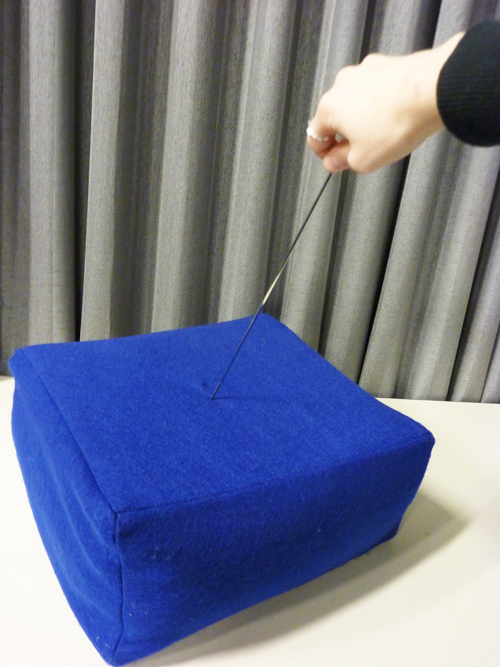 We created a large blue felt rectangular cushion that can be stabbed by a 15-inch long barbecue stick. Here, we tried to see what we could learn from a more aggressive gesture that was as much stabbing as piercing. 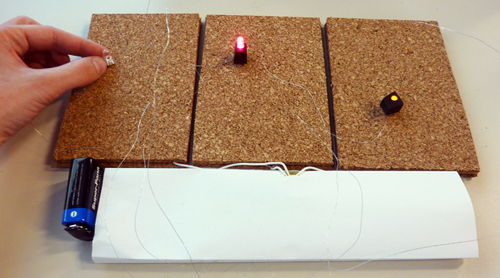 Poking the cork boards will complete the circuit and make the pins blink and fade in different patterns. It is up to you to decide what they mean!